In the Link to site field, enter the webpage address that your ad title will lead to. If your site is not set up yet, you can enter a link to your Address and phone number instead, which will lead the user to your contact information page, i.e. your vCard. Additionally, vCards contain a text field where you can expound in more detail about the advantages of your offer, tell the customer about your low delivery rates, or include whatever other information you think is important and doesn't fit into your main ad text. 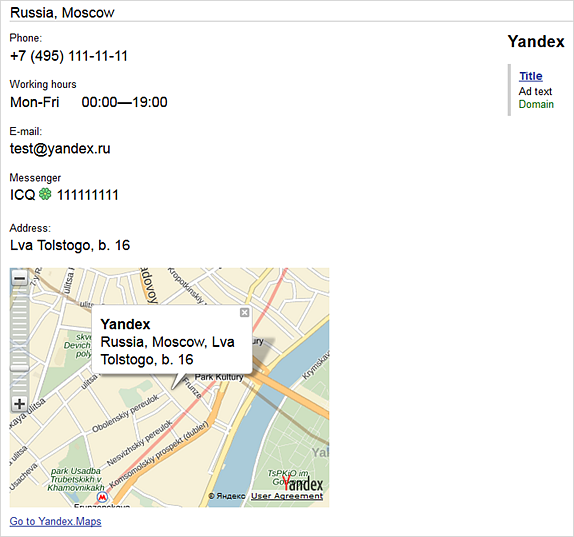 If the user clicks on both links (“Address and phone number” and the ad title) as well as the Yandex.Maps marker (in other words, they click through to both your vCard and ad site), you only pay for one click. The cost for clicking on ads is the same for both types of links as well as for map markers. Your contact details should be accurate, and any offers made over the phone should match the offer described in the ad text. You can also manually set your location on the map. If your company is open 24-hours, you should enter the opening hours 00:00 to 24:00 in your vCard. In this case, the user will see your opening hours on your contact information page listed as round-the-clock. Your opening hours will also be shown in your ad on search results pages. The Metro station is determined automatically when the address is included for an organization located in Moscow, Saint-Petersburg, or Kiev. The metro icon and station name will be added to the ad on Yandex search. This function can be disabled if necessary. For Skype users, the phone number will appear in bold and you can make calls from your computer in one click. After you fill out the contact page for the mobile version of your ad, the button Call will appear or a button with the contact number where you can be reached.